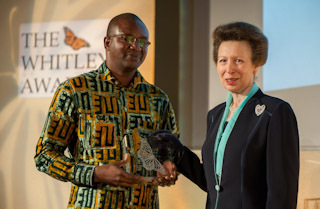 LONDON, UK: 9 MAY 2012 – HRH The Princess Royal (Princess Anne) tonight presented a Whitley Award for inspirational conservation leadership to Inza Koné, of Ivory Coast, for his work to provide a better future both for people and endangered wildlife in the swampland Tanoé Forest, at the border with Ghana. Inza, the head of biodiversity and food security with the Swiss Centre for Scientific Research received the honour during a ceremony at the Royal Geographical Society in London, hosted by Whitley Fund for Nature (WFN) – the UK-based charity which organises the international awards scheme. His Whitley Award comprises a project grant of £30,000 – donated by The Shears Foundation – an engraved trophy, membership of the influential network of past Whitley Award winners and professional development training. Congratulating Inza on his win, David Wallis, WFN’s Acting Director said: “WFN’s aim is to identify and support conservationists who are inspiring real and positive change for people and wildlife and the habitats they share. In this, Inza Koné faces particular challenges. Wildlife scientists are only just discovering how many species live in the Tanoe area, including two of west Africa’s most endangered monkeys and, very possibly, a third monkey declared ‘probably extinct’ in 2000. Yet the forests have few legal safeguards and face mounting pressure from the spread of palm oil plantations and the demand for bush-meat. The same ceremony also saw Dr Rodrigo Medellin of Mexico become the first-ever recipient of the newly-created Whitley Gold Award for outstanding achievement plus new project funding of £30,000, donated by The Friends of WFN. His award recognises the globally-significant contribution he has made to bat conservation since his success in WFN’s leadership grants scheme in 2004. As part of the ceremony, The Princess Royal and other guests watched a series of short films showing finalists at work. The screenings included a film about Inza Koné work, narrated by the distinguished wildlife broadcaster, Sir David Attenborough, a Trustee of WFN.